Carnival Parade Float Hits Power Line In Haiti; At Least 16 Dead : The Two-Way A power line came into contact with a crowded float during a large parade early Tuesday. Conflicting reports on the number of people killed range from 16 to 20, with dozens more wounded. 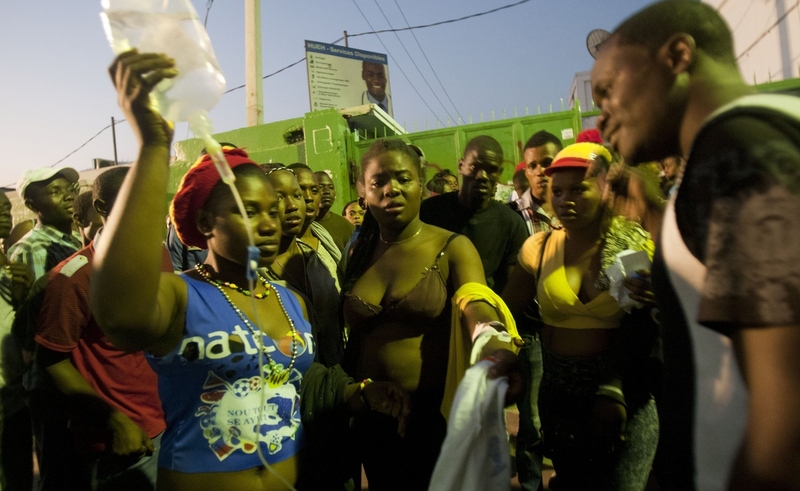 Injured revelers wait outside the General Hospital in Port-au-Prince, Haiti, early Tuesday. At least 18 people on a music group's packed Carnival float in the Haitian capital were reportedly killed when they were electrocuted by a power line, officials said. In Haiti, a celebration for Carnival became a source of sorrow and concern, after a crowded float came into contact with a power line during a parade early Tuesday. Conflicting reports on the number of people killed range from 16 to 20, with dozens more wounded. Details about the accident are still coming in; we'll update this post as news emerges. Officials say they're calling off the last day of the celebrations in Port-au-Prince, in the wake of the accident. And in a correction to multiple earlier reports, the death toll has been lowered to 16. "Prime Minister Evans Paul said 16 people were confirmed dead and 78 were injured," the AP reports. "His statement conflicted with earlier reports on the number of casualties. Nadia Lochard, a coordinator for the Department of Civil Protection, had said at least 20 people were killed." Video of the incident shows a large float for a band named the Barikad Crew trying to move beneath a series of wires — but at least one of the people who was standing high on the float seems to come into contact with a wire, setting off a bright flash of light and drawing gasps from the crowd. "I saw the wire falling and sparks and I started running for my life," Natacha Saint Fleur, 22, tells the AP. A sudden panic hit the area around the float, possibly causing more injuries, according to multiple news outlets. Photos from the scene moments before the accident show throngs of people packed into the area where huge floats are slowly pulled through. On Twitter, the hashtag #Kanaval2015 abruptly went from being a place to share photos of costumes and parties to a forum offering sympathy and prayers for those affected by the accident. A note also came from Haiti's President Michel J. Martelly, who extended his "sincere sympathies" to the victims. Some also called for Kanaval, as the three-day celebration is known in Haiti, to be called off early. "The death toll could be higher given that several of the health centers that had received patients in critical conditions had not yet provided a final report on the situation of the injured," according to the Haitian-Caribbean News Network. The network adds, "It is not clear whether the last carnival day [later on Tuesday] will actually take place. Officials plan to provide more information within the next hours."